The word “classic” gets tossed around too easily today. If something’s old, it’s called a classic, regardless of its quality or importance. This is especially true with videogames, where anything you might’ve played at an Aladdin’s Castle once in 1985 gets treated like a timeless pillar of the medium. As with movies, toys, TV shows, and so much other flotsam from the Reagan era, nostalgia makes almost every 1980s game seem more significant than it is. No game studio benefits more from nostalgia than Nintendo. Much of it is justified—the company’s major games from the 1980s are like a foundational text for the very notion of the videogame, from Donkey Kong to Super Mario Bros. to The Legend of Zelda. It’s why Nintendo can rerelease the same old games every few years and get people to pay for them once again—its most important games are legitimate classics on an incomparable level, and even its lesser works from the era tend to have a significant amount of charm. And then there’s Sky Skipper. 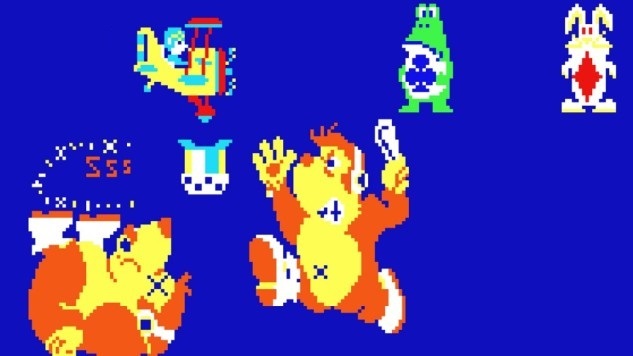 Made in 1981, this cartoonish tale of a pilot trying to rescue animals and playing card people from angry gorillas was supposed to be Nintendo’s follow-up to the smash Donkey Kong. Instead it bombed in Japanese arcades and tested so poorly in America that it was never even released over here. Most of the ten (some sources say 12) American test units were converted to play Popeye, which was a hit for Nintendo, and Sky Skipper itself was quickly forgotten by all but the most dedicated of Nintendo fans. After that long, arduous journey, Sky Skipper has finally escaped into the wild and is now playable for anybody with a Switch and eight dollars in their bank account. It’s from the ‘80s, it’s made by Nintendo, and its unusual, documentary-worthy path to rediscovery has the arc of a good detective story, so it seemed guaranteed to get the “lost classic” treatment. And yet, almost three weeks after its Switch debut, it’s largely been ignored, with only two reviews on Metacritic and barely more than a news post about its release at most game sites. There’s minimal chatter on Twitter or in Nintendo message boards. Sky Skipper took the longest, most strained trip from the arcades of 1981 to the consoles of today, and despite its pedigree and mystique, almost nobody seems to care. Sky Skipper definitely doesn’t deserve to be called a classic by anybody with any solid grasp on games history. It also didn’t deserve to go unreleased back in 1981, though, or overlooked today. Although it probably looks and feels almost unforgivably archaic to today’s audiences, it has enough of Nintendo’s trademark charm to win over anybody who can handle playing something so rudimentary. Between that charm and an unexpected, nascent complexity, it probably would’ve stood out among the other arcade games on display in 1981. Had it been released at the time, it would almost definitely be considered at least a minor classic today, simply for its uniqueness and the nostalgic reasons mentioned above. Forget about Sky Skipper as a game, though, no matter how cute and entertaining it might be. The story of its early death and long, weird revival is the most interesting thing about it, and not because of the work that went into rescuing it from oblivion. It’s like a placebo control group in an experiment in how nostalgia can color memory and history. Here’s a game whose greatest value was in the fact that, despite being made by the most legendary and beloved company in games, nobody remembered it or could play it. And now that it does exist, and can be played by the people who would be most interested in doing so, it’s once again disappeared almost immediately. It might be from the 1980s, and might have Nintendo’s name on the title screen and the company’s sensibilities in its design, but without the memory of pumping quarters into it on Saturday afternoons in the early years of Reagan’s first term, the nostalgia for it just doesn’t exist. It’s like Sky Skipper itself might as well not exist again, returning it straight to the fate it endured over the last 37 years. Even Nintendo can’t simply will nostalgia instantly to life.